We managed with satellite Internet for years, and while it has an ambience of funkiness and rugged individualism about it – ‘specially when you have to trek out to the dish through waist-deep snow to re-point the beast – we weren’t wholly sorry to part with it. Two years ago, we got real broadband, in the form of a Rogers 3G mobile hub. Admittedly, none of our friends from the city thought the mobile hub qualified as real broadband – you can’t really stream video over it, use it to make Skype calls or play on-line games in real time – but this was as naught. It was way quicker than satellite. The original Rogers mobile hub was an Ericcson W35 device, which was pretty cool as first-generation 3G mobile Internet went. It wasn’t without its issues, however. It was a bear to set up, it was almost impossible to find an antenna for when we got ours… and it crashed a lot. Not having to wait for every packet of data to travel through 45,000 miles of outer space to get to us, however, rendered these issues almost trivial. Our original Rogers hub came with a two-year contract, which expired last week as I write this. In the interim, better hub technology has appeared, and it was clearly time to upgrade. Rogers’ current mobile hub – they like to call it a “Rocket Hub” – is a NetComm device. NetComm hails from Australia, which seems to have been into 3G mobile Internet even earlier than Canada was, and likely for much the same reason. They have a lot of real estate occupied by relatively few people. 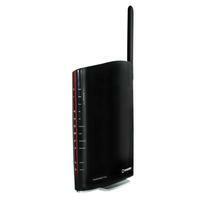 The NetComm 3G10WVR hub available from Rogers is a startling improvement over the original Ericcson W35 hub. It’s so simple to get up and running as to likely make most of its users certain they must have forgotten something. It manages about twenty percent better download speeds with the same signal strength. Perhaps most saliently, it never crashes. Removing the SIM card from the old hub and snapping it into the new one. Moving the Ethernet cable from the old hub to the new hub. Connecting the external antenna that drove the old hub to the new hub. Plugging in the new hub and watching the pretty lights. Upon doing so, nothing smoked, detonated, voided its warranty or displayed an error message. The Internet was immediately available… just a bit quicker than before. We were seriously shocked. As with the original Rogers hub, the NetComm 3G10WVR includes options for a voice telephone connection, which we didn’t use, and integral WiFi, which we disabled in favor of an external Belkin WiFi router with way better range. As such, there was virtually nothing to configure in setting up the NetComm 3G10WVR hub. This was almost a shame, as it has an unusually well thought-out user interface. A mobile Internet hub is actually a mutated cell phone. It uses the same 3G cellular network that conventional mobile devices connect to, save that rather than a touch screen and a tiny speaker, it has an Internet router and some Ethernet ports. Availed of a decent level of signal and a suitable cellular data account, such a device can connect to the ‘net without wires. If you consult Rogers’ 3G coverage map, you’ll likely conclude that blistering 7.2 megabit Internet should be available pretty much anywhere south of the arctic circle. This might be slightly optimistic. As with conventional cell phones, the signal available to an Internet hub varies… a lot… with the topography local to wherever it’s plugged in, and the current meteorology. Rogers’ web page originally led us to believe that we’d enjoy sufficient signal strength to microwave a medium-size chicken. As it turned out, absolutely no chickens were harmed during the making of this film. The NetComm 3G10WVR hub comes with a small external antenna that screws into the back of the hub, and looks like it might have been useful for stirring paint in another life. It works surprisingly well, and we were able to enjoy a respectable, solid 3G connection with nothing more than the toys than came in the box. This said, we sweated blood to find an external antenna for the original Ericcson hub, and it was truly satisfying to discover that it could replace the small antenna supplied with the hub… instantly increasing the hub’s signal strength by a bar. Should you be updating from an earlier hub, keep in mind that most of the external antenna solutions available for the original Rogers mobile hub included a standard large cable connector and an adapter lead to make them compatible with the small antenna jack of the Ericcson W35 hub. Remove the adapter lead and the connector that’s left should fit the antenna connector of the NetComm 3G10WVR hub. Our external antenna is a small Wilson Electronics device sold by R.F. Connections. One of the ineffable qualities of a mobile Internet hub is determining whether you’ll actually have enough signal to operate one from your digs. You might require a larger antenna… or no antenna at all, if the gods are in a good mood. As with the earlier Rogers’ hub, you can buy the NetComm 3G10WVR, take it home, try it out and return it if you can’t successfully connect it to the sky. This said, it’s worth keeping in mind that Rogers’ conditions for accepting a returned hub and gracefully absolving you of its attendant two-year contract are somewhat more stringent than hitherto was the case. According to the documentation that arrived with ours, we had fifteen days to try it out… as long as it was returned with less than thirty minutes of air time on its clock. Admittedly, the information sheet that included these details did sound suspiciously like it had been incompletely adapted from one shipped with a mobile telephone. In the event that you do decide to return a Rogers hub, it’s a profoundly good idea to hover over the Rogers staff member who accepts it until you’re certain they’ve entirely nuked your account, and then get something in writing to this effect. Our first exploration of this technology entailed returning it… followed by several hours of listening to advertisements-on-hold for iPhones while various support people at Rogers purported to be addressing the matter of our continuing to be billed for it. As an aside, the NetComm 3G10WVR hub measures its signal strength on a scale of zero to five bars, just like other mobile devices. Its front panel, however, only has three lights for signal strength. If you have cause to determine what the little man behind the curtain is really up to, you’ll need to log into the hub’s web-based user interface to see actual bars. As of this writing, Ropers advertises the NetComm 3G10WVR hub for $149.99 if you agree to a two-year term, or $399.99 if you want to buy one outright. It’s worth noting that Bell and Telus, Rogers’ largest competitors, offer comparable devices for $99.99 or so. In addition to the hub itself, you’ll need a data plan. Rogers’ offers a flexible plan, whereby you can use up to three gigabytes of data per month for $46.93. If you exceed three gigabytes, the plan pops up to 56.93 for five gigabytes, and will continue to expand if you prove to be still more voracious of bandwidth. Bell and Telus have comparable data plans. In our initial shopping around for a next-generation hub, we found that Bell was prepared to offer us a ten dollar per month reduction for their data plan – to $35.00 per month – as a loyalty bonus because we have a Bell land-line telephone. Telus offered us a comparable discount because I have a Telus cell phone. In addition to these prices, Bell and Telus each wanted a $35 setup fee. Rogers’ data plan rates are $1.93 higher than those of Bell and Telus, as nearly we could tell… the difference being something they call a “government regulatory recovery fee,” and subsequently never really explained. In the event that you’re upgrading from the original Rogers hub, you’ll probably find Rogers to be particularly accommodating… as long as you find the right denizen of Mr. Rogers’ neighborhood to negotiate with. Most of them don’t seem to be empowered to adjust the prices stated at Rogers’ web page. Contact the Rogers wireless department, however, and tell them that you’re thinking of switching to Bell or Telus when your current contract expires… they were breathtakingly reasonable with us thereafter. We enjoyed an upgrade to the new NetComm 3G10WVR hub for $99.99 – or fifty dollars less than the stated retail price for this device. The three-gigabyte monthly data plan dropped to $36.93. They sent the hub up by UPS, and it arrived the next day, along with the whole pricing structure in writing, just as was discussed on the phone. They waived the $35 setup fee. While there are few wholly positive things to be said for a disintegrating economy, the opportunity to squeeze large telecommunications oligarchies for better pricing is arguably one of them. Calling Rogers directly will almost certainly get you considerably further up the food chain than speaking to someone at a Rogers retail store. The latter entities don’t seem to have the authority to bend the rules to any useful degree. It’s probably worth mentioning that if you’re upgrading from the original Rogers mobile Internet hub at the expiry of its contract – and assuming that you haven’t managed to drop it or caused it to explode – you now own that earlier technology. It’s worth hanging onto, as it can go back on line if something bad happens to your new hub, necessitating that it be dispatched for repair. Unlike as with the original Ericcson Rogers hub – for which technical support from Rogers was an excruciating descent into madness and outrage – our NetComm 3G10WVR hub came on line with no detectable issues, and as such, no recourse to advertising on hold. Rogers’ support may still make strong men weep, but we didn’t have cause to experience it. NetComm, the manufacturer of the current Rogers hub, has a real web page with real support staff – if you do have issues with the device, you can ask questions of NetComm’s support staff and receive a cogent, appropriate reply in about a day. In choosing a mobile Internet provider, it’s arguably worth noting that your ability to receive enough signal to make the whole works worth the effort will be predicated upon your proximity to a cell tower. In many parts of rural Canada, Bell and Telus share towers, and Rogers has its own towers. In the event that you bring home a Rogers hub and find it breathing vacuum, it’s well worth trying the mobile internet technology from Rogers’ competitors. As of this writing, you can access an extensive on-line map of Canadian cell phone towers. It’s a useful tool to determine which of the 3G networks is most likely to work for you. Two days before we ordered the new Rogers hub, protest signs proclaiming “Stop the Tower” appeared a mile from the entrance to our driveway. Some investigation revealed that Rogers proposes to build a new tower minutes from our house. It’s not on line as yet, but it will unquestionably light up all the bars in our mobile hub when it is. Finally, if you decide to scope out the Rogers mobile hub in a Rogers retail store – or if you raise the issue with someone from Bell – you’ll unquestionably be apprised of the observation that the NetComm 3G10WVR hub is a 3G device, and that it’s incapable of utilizing the much faster 4G cellular networks, where they’re available. As of this writing, 4G networks are largely an urban phenomenon. If you live somewhere that will allow you to connect to a 4G network, you don’t really need a mobile hub at all – you can probably just subscribe to conventional wired Internet access. The NetComm 3G10WVR hub is a thoroughly likeable device, with no issues worth mentioning. Its manifestation as Rogers’ current mobile Internet hub comes with extensive documentation on a CD-ROM – that you’re unlikely to need – and a concise “quick start” leaflet to get it up and running in minutes. Once it’s working, it’s about as complicated to operate as a brick. It even looks cool. Afterword: Our NetComm 3G10WVR hub did encounter one occasional issue – several times a week, it would prove to be unable to surf the web until it was reset. Unlike its predecessor, it hadn’t actually lost its grip on cyberspace when this happened, however, as things like e-mail and terminal access remained functional. Posing the matter to NetComm’s e-mail support resolved this one, obscure through it was. By default, the hub asks one of Rogers’ servers for the address of a DNS server, this being the entity that resolves URL addresses into the numerical IP addresses that underlie the movement of data across the ‘net. From time to time, Roger’ DNS servers appear to disappear into the great cosmic void for a tea break, and the NetComm hub has nowhere to turn for guidance. The hub can be configured to use specific DNS servers – the relevant configuration items are in the Advanced -> DNS -> DNS Server screen of the hub’s configuration pages. NetComm’s support staff recommended enabling the Static DNS option, and using the servers 4.2.2.2 and 4.2.2.3. This largely resolved the problem, although these servers aren’t wholly bulletproof either. The ideal settings for this screen appear to be the DNS servers at 4.2.2.2 and 64.71.255.253, the latter being one of Rogers’ DNS servers. It’s cosmically unlikely that both of them will go off line at the same time. Love your post…was very helpful. I live in the woods and have found that the Netcomm actually manages to work where xplornet failed. Was intrigued by your comment about favouring the Belkin instead of the internal wireless… I have more devices than the Netcomm supports and would like to find a work around.